We will inform you about seminars and lecture information open to the public that we are involved. These seminars are supported by 国立大学法人国際競争力強化事業（京都大学）. 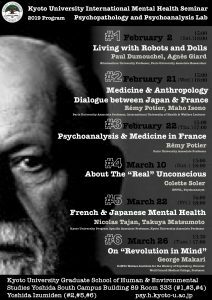 Here we will inform you about seminars and lecture information in Kyoto University. Within Kyoto University, our seminars are held every Thursday (13:00-14:30) during the term. German literature / French literature book clubs are also held.